According to researchers, the state of IoT market has not seen an explosion in 2018 as it has in 2017, but predictions for this year are that adoption of this technology will move forward. The complexity of the IoT, lack of technical skills even in large companies to execute IoT initiatives at scale, huge numbers of vendors on the market which creates confusion, and performance and security concerns were still adoption challenges. is from consumer landscape, where 56 million smart speakers were sold in 2018, although the product barely existed as a category a few years ago. Now home automation and smart speakers are found in over 20% of homes in the United States. The smart home and connected devices markets should continue to grow to meet customer demand. In the B2B and enterprise space, numerous initiatives emerged last year. Smart city were most common IoT projects, with traffic monitoring, parking management and other applications. Industrial applications followed closely behind, with the connected industry and monitoring buildings use cases, according to IoT Analytics. Also in 2018 a number of logistics and delivery vendor’s started to implement IoT technology with clear benefits. 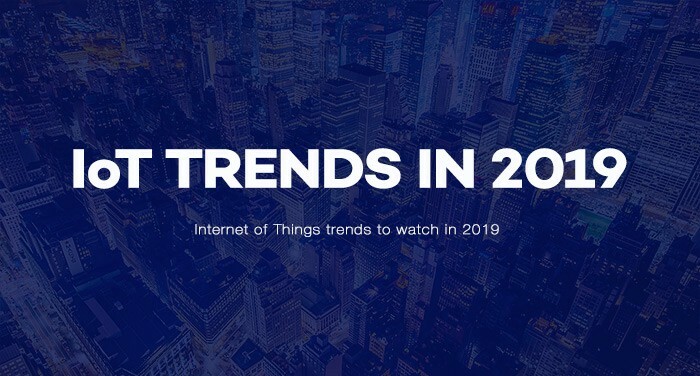 Following are IoT trends we can expect to see in 2019. Edge computing is predicted as the next big thing. With a number of connected devices and amount of data exponentially rising every year, the capability of processing data near to the edge of the network where data is created instead of the centralized cloud is gaining momentum continuously and will be indispensable. According to recent estimations, 45% of all data created by IoT devices will be stored, processed, analyzed and acted upon close to the edge of the network by 2020. For many technologies and industries, advantages of edge computing are critical like low latency, the immediacy of analysis and acting on the source of data where the most urgent decision and actions may be taken. And access to temporal data for real-time analytics, elimination of intermittent internet connectivity and security concerns are equally important. In 2019, edge computing solutions will have significant if a not crucial role for autonomous vehicles and remote offshore oil rigs where it will mean the difference between normal operations and a disaster. Smart city projects providing cities with the ability to react dynamically to their environment and changing conditions as they occur. The financial sector will utilize the benefits of this technology in stock exchanges around the world, to run resource-intensive algorithms as close to the source of data as possible. Industrial manufacturing will benefit immensely by incorporating data storage and computing into industrial assets and machinery. Extreme high bandwidth, ultra-low latency, and high-density connections, all features of the 5G network, with the infrastructure needed to carry huge amounts of data will enhance the Internet of Things and enable innovative use cases that are impossible to be done via older network standards. The list of technologies which capabilities will be significantly improved with the deployment of 5G is long. First, already mentioned edge computing, artificial intelligence and machine learning, robotics, and automation, drones, virtual and augmented reality (AR) which will especially benefit from 5G. Faster speeds and more reliable connections will also provide crucial benefits in areas like autonomous vehicles and Industrial IoT, public safety/emergency, and government services. The top emerging startups last year in the USA were from the healthcare industry. This trend will surely continue as the value of IoT solutions for the medical sector is evident with the clear and measurable benefits. Areas of significant improvements provided by IoT are supply and drug management with real-time inventory and remote tracking of assets, for example, supplies consumed during surgical procedures which reduced the likelihood of infections and decreased waste and expired supplies. Remote health monitoring solutions for different kind of diseases like heart arrhythmia is already saving lives and reducing costs by 50%. Bed tracking technology is enhancing patient experience through reduced and always extremely stressful emergency/admission waiting. This trend can only go up next year since many manufacturers already started to explore AR in several areas which can benefit from this technology. For complex assembly of the huge number of components, AR is replacing traditional static paper instructions always hard to follow, with glanceable hand free and voice-controlled instructions with video from the last assembly procedures. Maintenance and field service of manufacturing equipment is also significantly improved allowing technicians to have instant intelligence and problems insights, empowering them to accomplish more in less time and more efficiently. Other manufacturing areas which will be enhanced by AR in a similar fashion are product design and development, quality assurance, hands-on and safety training of new employees, and streamlined logistic. The facilities management industry worth $1.12 Trillion started moving towards with IoT data-driven approach operations. Potential is huge, considering that most buildings are still energy inefficient, hard to maintain, and not comfortable for their occupants. Buildings will become energy efficient with optimized heating, ventilation and air conditioning systems, and more efficient lighting. Smart buildings will increasingly move towards space optimization, object detection for safety, security, wayfinding, and asset tracking, with the help of advanced technologies like location services, image recognition vision and ML. According to Forrester research, in 2019 bundled service offering will catalyze a sleepy consumer IoT market. Utilities, insurance, grocery and food companies will offer subscription offerings. Given example is Verizon’s Hum, an automobile service that combines roadside assistance, maintenance monitoring, and driver monitoring using two in-car devices for $20 per month, which in that way avoids the upfront IoT device costs. One of the main challenges that are still hindering IoT wide adoption is the complexity and multilayered nature of internet of things technology. This is already and will be even more addressed by offerings which will cover planning, assessment, implementation and IoT platform services for IoT solutions across many vertical markets and use cases. Additionally, service offerings which will help manage, monitor and operate the constantly growing number of smart products, devices, networks and assets, will emerge in 2019 according to Forrester, with stakeholders from manufacturing, healthcare, retail, and utility markets. in 2019 we will see more companies changing their business models — instead of selling their products they will sell services. Customers will no longer buy just a machine or equipment, but rather the service it performs. This business model is successfully implemented by Rolls-Royce, which does not sell engines, but charges airline the time they are flying. Value is more than clear both for manufacturers and customers. Engines send telemetry data to centers accumulating a treasure of operations data, which enables significant improvement and consulting airlines on best practices. What’s more important inspection can be scheduled at or spare parts can be directed to the right destination even before the pilots or the airline know that one of their aircraft has a problem. Additionally, this makes it very hard for a third party to steal maintenance business from Rolls-Royce which now accounts for more than half of Rolls-Royce’s revenue. Cities are becoming massive information gathering centers, with the possibility to respond to problems faster than before, pertaining to infrastructure, traffic or utility usage. Last year we saw projects and innovations that helped cities to improve their services, reduce costs, and enhance communication and interaction with the citizens. Smart parking and real-time monitoring of traffic incidents help drivers to divert their routes in the most optimal ways to lessen traffic congestion and smart traffic signals that act wisely as per diverse traffic densities across different timings are providing huge cost savings and reduce pollution in cities. With energy consumption as a global issue, we will see more Smart lighting solutions, since implemented projects reduced loss by almost 33% using wireless mesh networking sensors, placed all over the city. New waste management systems created the most optimized route for waste collected for each garbage disposal truck and reduced collection cost and improved street sanitation. Smart metering networks already have huge roll-outs in Europe, providing citizens with more control over their home utilities and utility companies to monitor demand in real time and redirect resources as necessary. In March last year, a series of cyber attacks on public institutions occurred across America, including the March ransomware attack which crippled the city of Atlanta for days. Calculated damage was close to $17 million. It seems that smart city projects fail to secure communication infrastructure, connected devices, and sensors. In Atlanta attack occurred although city official received warnings that their system is vulnerable. In 2019, we can expect that cybercriminals will continue with ransom attacks against vulnerable segments of smart city implementations, which will definitely force city officials to invest in cybersecurity defenses to minimize the risk of further attacks. The top concern among companies and all kind of interested stakeholders, identified by many types of research and surveys is security. Of course, security is the huge problem which existed before internet of things technology emerged. Having in mind many technology layers necessary for IoT solutions and comprehensive security needed around connected sensors, devices, connectivity, and the cloud, it is easy to understand the hesitation many companies have regarding IoT. Creative ways that hackers can use to break in the system even using connected refrigerators or aquarium thermostat to break into a system is forcing IoT vendors and technology provides to focus more on increased security and develop end-to-end security at the core of their offerings. Although the potential of IoT for the industrial sector is huge and unquestionable, adoption is still not as expected. To all challenges mentioned in the begging of this article, the gap between IT and OT sectors should be listed, considering that cooperation between these two areas is necessary for any industrial context for developing IoT solutions. An additional reason is that big companies doubt in benefits of IoT since they believe that their existing solutions are sufficient and solid. However, a number of projects deployed in various sectors of industries in the past few years are not small. According to IoT analytics’s comprehensive report compiled over the course of 18+ months covering 38 detailed case studies, featuring 50+ end users and I4.0 suppliers, twelve most popular I4.0 use cases stand out. Advanced digital product development emerged as the largest use case as companies are using additive manufacturing, AR/VR, and digital twin technologies to reduce product development costs and time to market. Predictive maintenance, data-driven quality control, remote service, data-driven asset/plant performance optimization, are following and will be more and more popular since they provide an improvement in operational KPIs and tangible ROIs. In other industry segments, connected cars, smart building and in farming will accelerate as the ROI is more clear-cut.